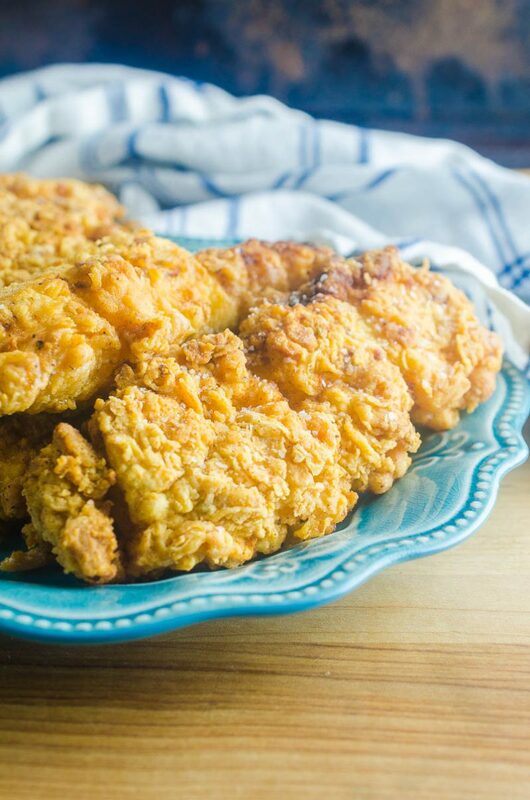 Chicken tenders are a classic family favorite. 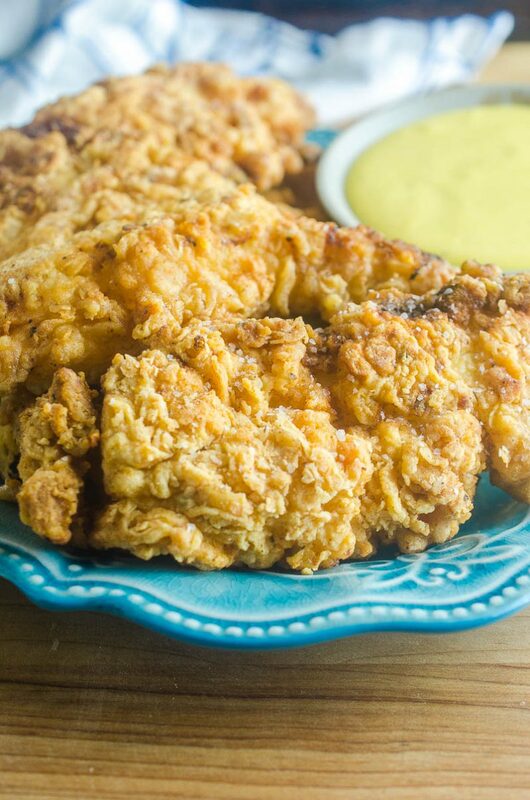 Chicken tenders are marinated in buttermilk, coated in a crisp batter and fried to perfection. The whole family will love them! One of my kiddos favorite things to get when we go out to dinner is chicken tenders. I mean whose isn’t really? And guess what, they are surprisingly easy to make at home. 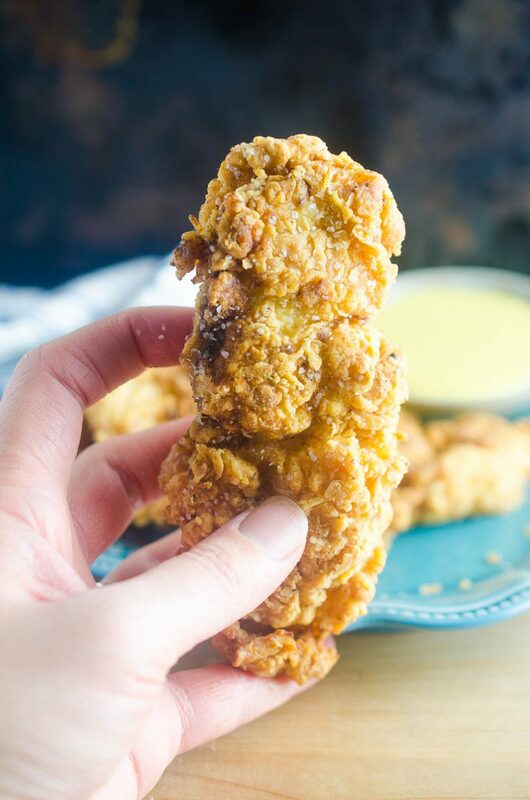 And today I am going to show you how to make this basic, classic crispy chicken tender recipe that the whole family will love. 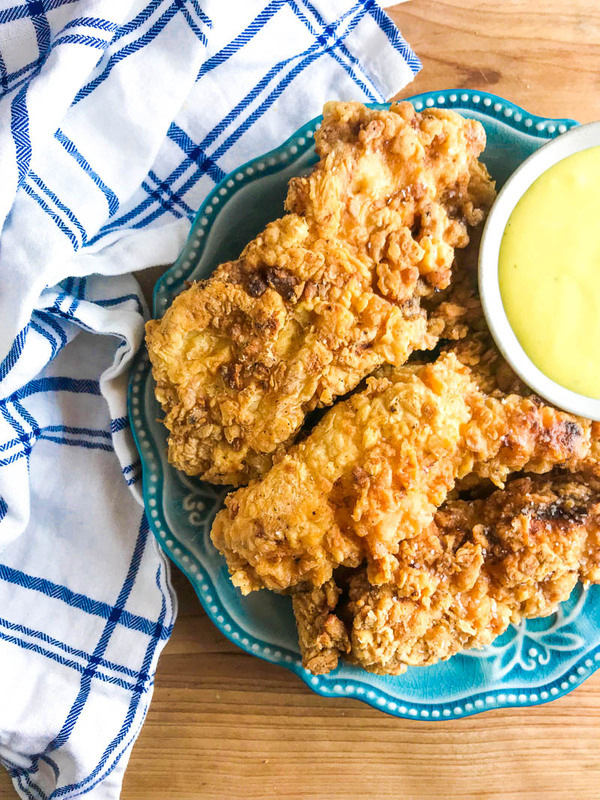 Called chicken tenders, chicken fingers or chicken strips, chicken tenders are simply strips of chicken breasts usually breaded and fried. Or baked. You can find chicken tenders already cut in the meat section at your grocery store. However, I find that they are often more expensive. Instead, I like to buy boneless skinless chicken breasts and cut them into strips myself. You’ll want to cut them into one to one and a half inch strips. How do you make chicken tenders? Step one: Marinate the chicken strips. 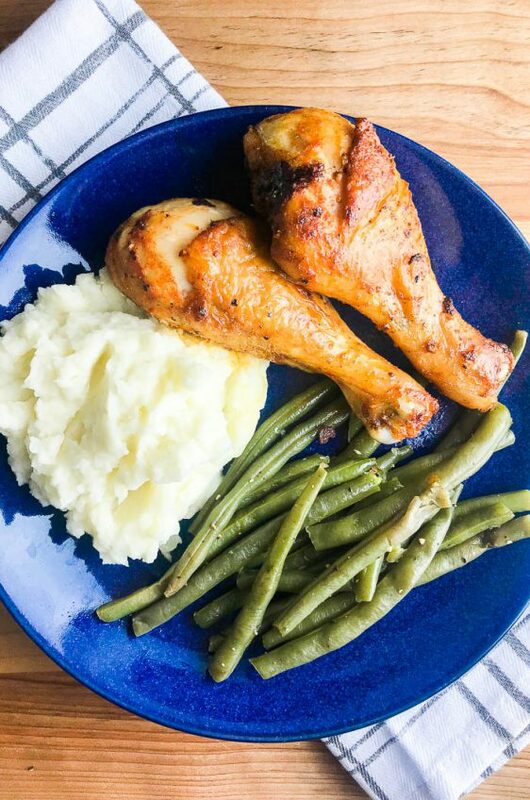 For this recipe, you will marinate the chicken in a mixture of buttermilk, hot sauce and seasoning salt for at least 3 hours. Overnight works too if you have the time. This helps tenderize the chicken. And since we are using chicken breasts, that is important. To get the perfect crisp chicken tender, you will want to double bread them. This means dipping them in the wet ingredients, then dry, then wet, then dry again. 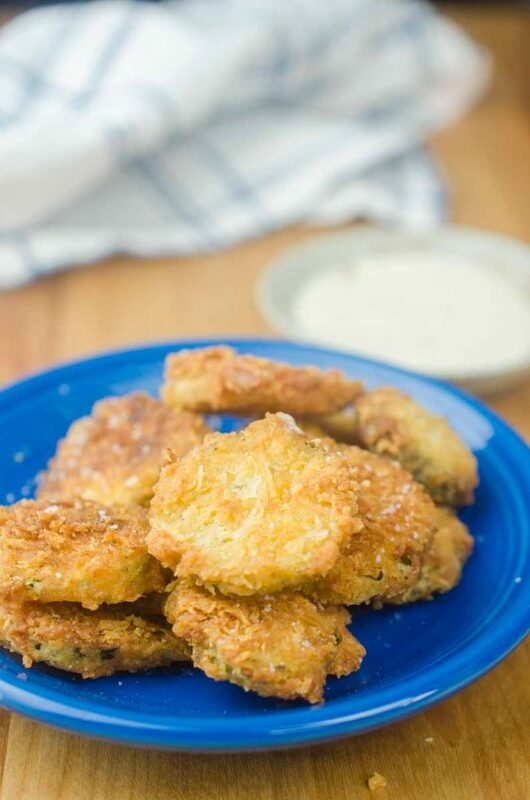 This gives them a nice thick coating that gets perfectly crispy when fried. I find that a mixture of flour and cornstarch give creates a wonderfully crisp batter. Another tip: set up an assembly line. The chicken in one bowl, eggs in another and the flour mixture on a plate. This will make the whole process go quickly and smoothly. Step three: Fry them. You’ll need to heat 1 cup of oil to 350 degrees. You will want to use an oil that has a higher smoke point like canola or avocado.Fry them 3 to 4 minutes or until they are cooked through and golden brown. This will need to be done in batches so as not to crowd the pan. To keep the chicken warm while cooking, place in a warm oven on top of a cooling rack. 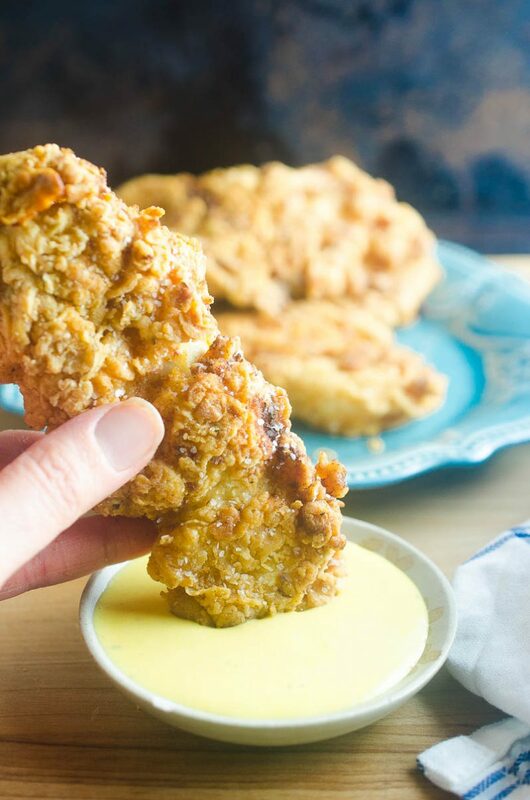 Because of the breading on these, I would not recommend baking these chicken tenders. 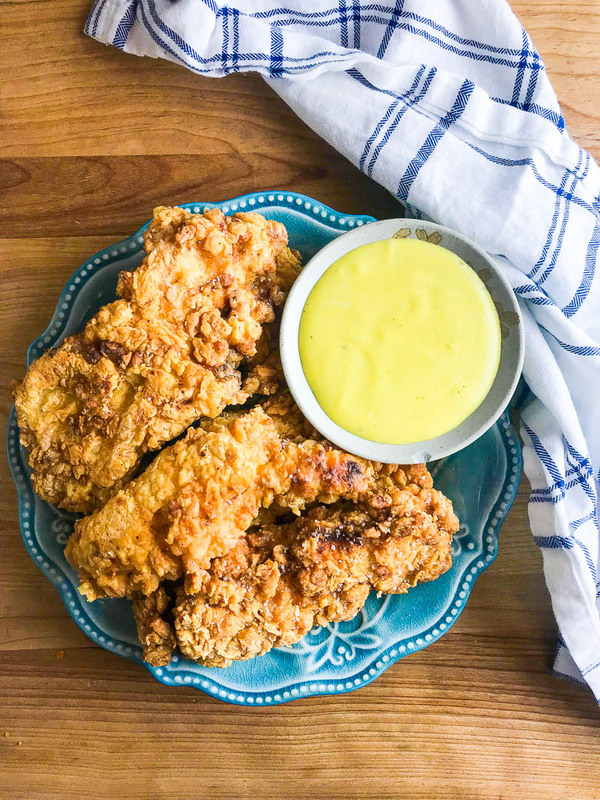 If you are looking for a baked version, check out my Honey Mustard Chicken Tenders. 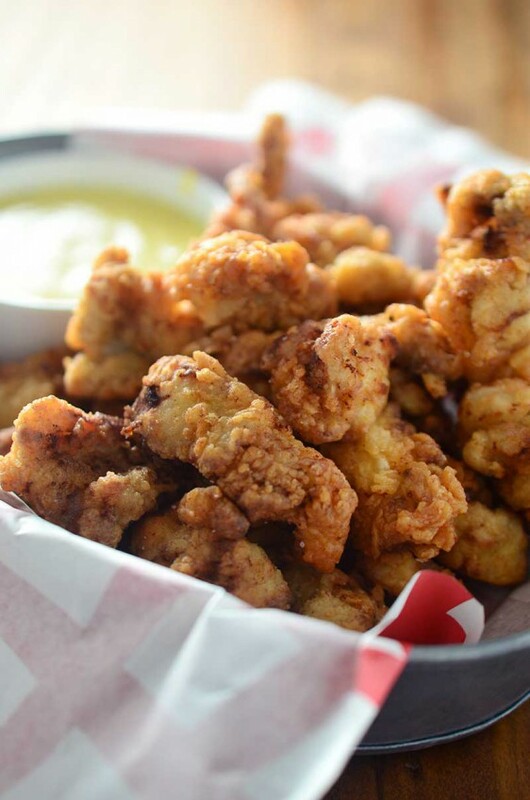 What do you serve with chicken tenders? Obviously, the first thing that comes to mind is french fries. I also like other comfort food favorites like Instant Pot Macaroni and Cheese, Mashed Potatoes and Summer Savory Green Beans. 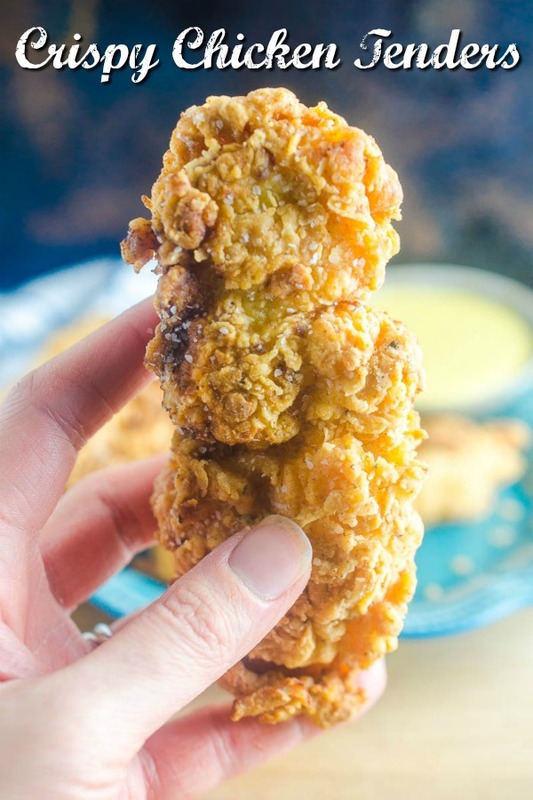 What is a good dip for chicken tenders? That is my favorite part! There are so many good dips. A personal favorite around here is honey mustard dressing. Creamy Ranch Dip is also good. Other favorites are BBQ and of course, ketchup. Combine buttermilk, hot sauce and seasoning salt together. Add chicken strips and toss to coat. Cover and marinate for at least 3 hours. Combine flour, cornstarch, salt, paprika, granulated garlic and pepper together in a bowl. Whisk together eggs and water. Shake off excess buttermilk, dredge chicken in flour mixture, dip in egg and dredge once more in flour mixture. Repeat until all chicken is coated. 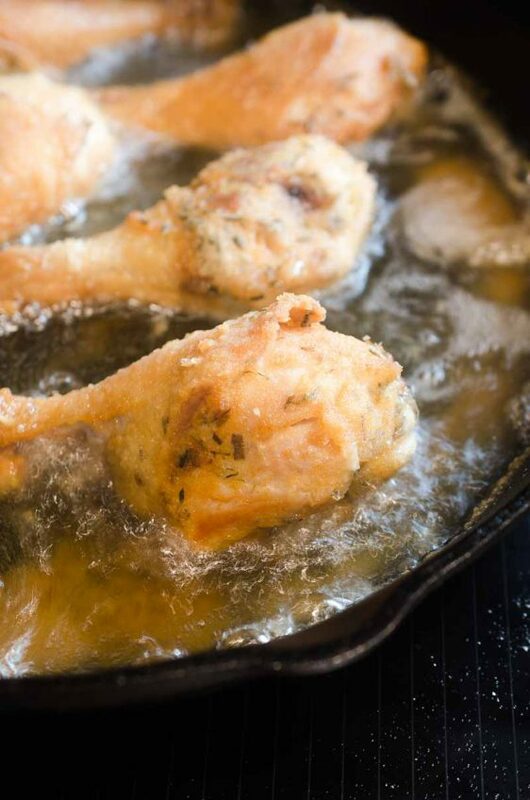 Fry chicken, in batches, 3 - 4 minutes per side until cooked through and golden brown. Transfer chicken to a cooling rack and keep warm in the oven while you cook the remaining chicken. Serve immediately. I love how crispy they look! I want to eat them now! Looks so good! 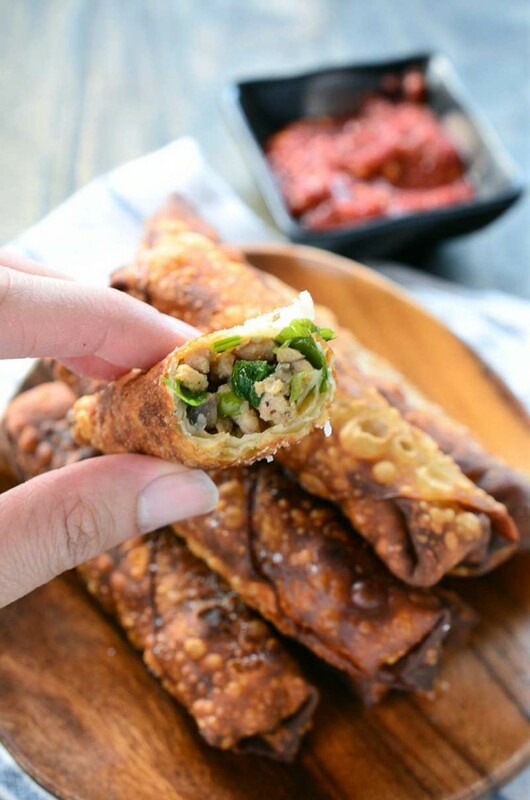 Our family will surely love this, so perfect I can make them at home now! These look PERFECTLY crispy! So so yummy! WOW!! 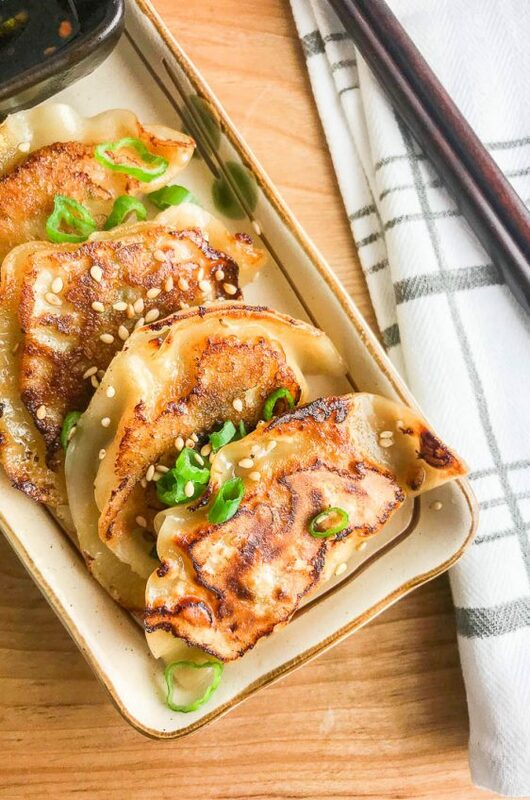 These look and sound incredibly delicious! My kids would LOVE them!! Wow. It was delicious. I like the crust because it didn’t fall off the chicken. This one tastes great. I made these and even my ultra picky eater ate them with relish. In fact he wanted them for breakfast AND lunch the next day.